Home > BRUSHES > 3/4" Susan Scheewe Angular Foliage Long Handle Brush - The original Grambacher Long handled foliage brush. Limited supplies. 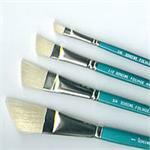 This is an invaluable brush for creating foliage in your paintings. This is a brush you will come to love and treasure. Before using, soak the foliage brush in water to flare out the bristles, Wring out the water in your brush and tap in the pigment and you are off to creating some of the best foliage you have seen.